Speed up your online backup! "IDrive Express is a common-sense solution to time-consuming online backups." Backup or retrieve several gigabytes of data, within a week, using physical shipment of temporary storage devices sent by IDrive. All you need to do is use Local Backup from the IDrive application and securely backup or restore all of your data from the hard drive and return the drive to IDrive. Quickly transfer large amounts of data to your online account, in just a week or less. Data is kept safe throughout the process using military grade 256-bit AES encryption with the option for a private key. For ensuring utmost security, along with file data encryption, IDrive does file path encryption too. Once the data is transferred to your online account, you can continue with incremental backups. No bandwidth usage during data transfers. For your Servers and Databases - get faster data backups and quick data restores. * This service comes FREE for Express Backup, once a year for Personal users and thrice yearly for Business users. Subsequent backup requests will be subject to the $59.95 charge. Express Restores will be charged $99.50 per request. Download and install the application to securely transfer your data from your computer to the temporary storage device shipped to you from IDrive. Once you receive the temporary storage device, securely transfer all your data using IDrive's Local Backup and ship the device back to us. We will transfer your data from the device onto IDrive's primary storage devices. 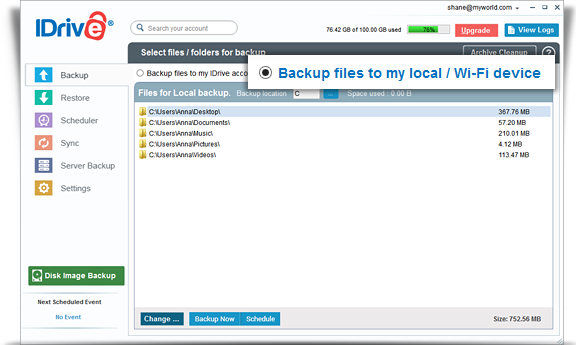 You can then proceed with incremental backups through the online backup process. Once you request for the retrieval of data, most recent version is taken from the IDrive servers and saved to a temporary storage device. It is then shipped to you. All you need to do is plug the drive into your computer via the USB cable and restore your data to your system using the IDrive application. You must return the storage device that we send you after you restore your data. This service is not available for accounts created prior to 10-31-2011. The service time does not include the time the drive remains in the customer's possession as it is beyond our control. Orders placed during business hours will be entitled to the 48 hour time frame, excluding weekends. Action cannot be taken after hours or on weekends. All orders should be placed before 3 PM, to start the 48 hour period that day. Orders placed after 3 PM (Pacific Time) will be considered received at 9 AM (Pacific Time) the following working day. We may contact you after you place an order to verify its legitimacy. The 48 hour time frame is for data retrieval up to 1 TB. Larger capacity restores can take longer. If your data exceeds 1 TB, we recommend you indicate any critical data, so that we can prioritize its retrieval. While we take every possible precaution, there is always the potential for technical difficulty related delays. International customers are responsible for all shipping charges, including return shipping of hard drives. For reference here is a chart of estimated shipping charges (Prices displayed in US Dollars). Fees may change without prior notice. Additional fees from customs may be added for some international orders by certain countries. IDrive is not responsible for shipping fees or customs fees for international orders.